"Lions Eat Meat, So Humans Should Eat Meat!" If you don't have time to read this entire post, you may scroll to the bottom to read a short summary of the main ideas. If you're a vegan on social media, it's likely you've heard one of the most common arguments against veganism - Lions eat meat, so humans should eat meat. There is so much wrong with this statement that it's difficult to know where to begin. First off, however, we can at least firmly establish that humans are in fact not lions, nor are we closely related to them. This fact is set in stone. "We can firmly establish that humans are in fact not lions, nor are we closely related to them." To build on this idea that humans are not lions, we can discuss our dietary differences. The modern human is considered omnivorous. By definition, an omnivorous animal is able to digest both animal and plant matter. Humans, as omnivorous animals, have a choice in whether or not to eat meat. We can survive with or without it - but we can't survive without eating plants (at least nobody has as of yet). Lions, on the other hand, don't have a choice - they're obligate carnivores, meaning that they subsist solely on animal matter. Another problem with this argument also relates to the matter of choice. The majority of humans living in developed societies have an abundance of options available to them in terms of food. All we need to do is walk or drive to the local shopping center and we're faced with thousands of choices. Lions, on the other hand, tend to live in desolate environments where food sources are scarce. They genuinely have no choice but to eat animals - if they didn't, they would die. The majority of humans, however, have the (generally much cheaper, healthier and easier) choice to eat only plant matter. This idea can be summed up with one excellent quote: If you could live happily and healthily without harming others, why wouldn't you? This is a wonderful quote because it highlights this concept of choice in the simplest way possible. There is no real way to argue against this quote - nobody can say that it's impossible to be healthy and happy as a vegan. There are millions of healthy and happy vegans existing as living proof of this concept. Humans can easily obtain all nutrients needed to keep our bodies running through the sole consumption of plant matter. Lions, however, don't have this option. "If you could live happily and healthily without harming others, why wouldn't you?" To further elaborate on the stark difference between humans and lions, I'll bring up a few common lion behaviours that would be completely unacceptable for any human to even think about doing. Would it, for example, be morally acceptable for a human to carry their young by the neck? With their teeth? No, of course not... but lions do it all the time. Would a lion licking its private parts be considered weird, creepy and downright inappropriate? No, of course not - but, if a human were to do the same thing in public, the reaction would obviously be quite different! Evidently, lions and humans have acutely different moral standards. So, just because it's morally acceptable for a lion to eat meat doesn't mean the same for humans. So, we can easily conclude that this all comes down to the concept of choice. Most humans have access to a wide variety of healthy food that doesn't result from the death of an animal. Lions do not. As omnivores, we can subsist entirely on plant-based diets without having to worry about missing out on any essential vitamins or minerals. Our health won't be compromised. Given the choice between contributing to animal harm and not contributing to animal harm (while remaining healthy either way), I'll pick the latter every time. Veganism is the best way to avoid harming animals and the environment. It's a simple, easy choice available to the majority of humans on this planet. 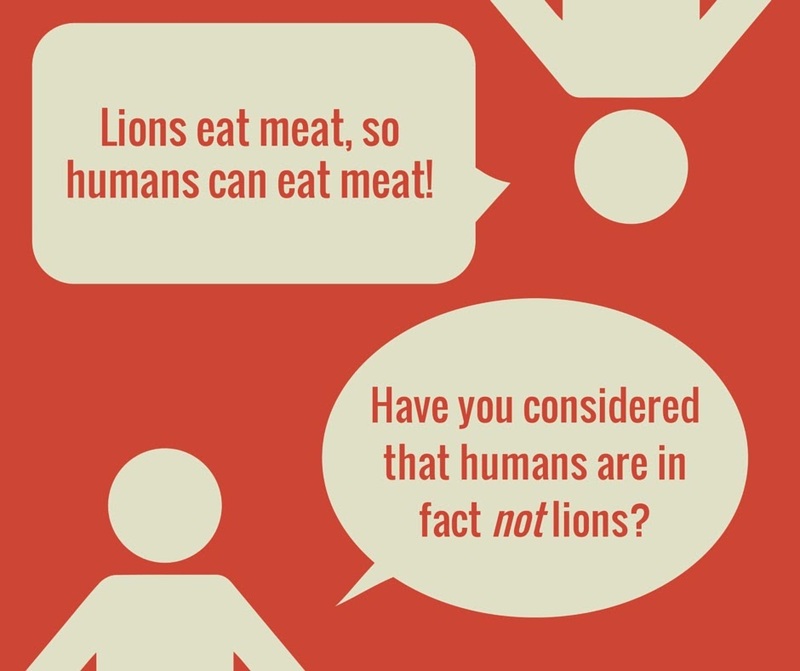 Lions, unlike humans, simply can't be vegan - so the comparison between us isn't valid. 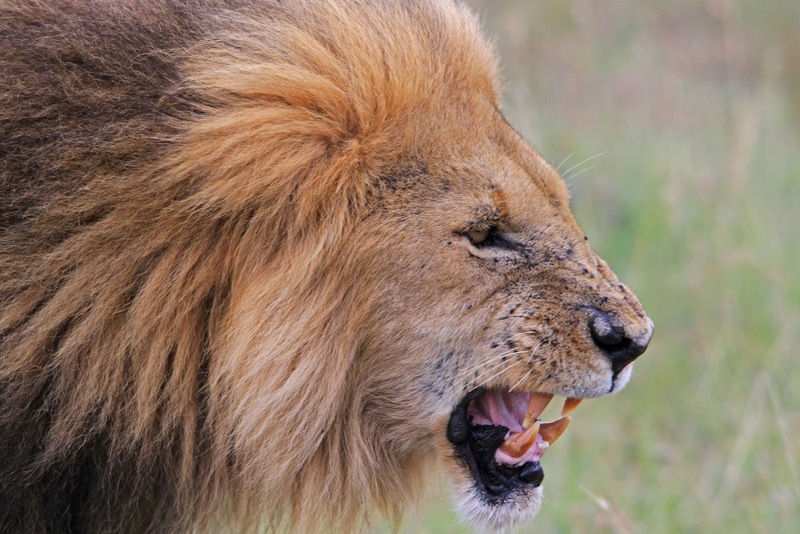 Overall, humans and lions are so biologically different that it's silly to try and connect the two species, especially in terms of dietary requirements and lifestyle choices. Humans are not lions - would you believe it? !